An attempt to get what they want in spite of the obstacles. Everybody wants something. It is what motivates them. Tapping into this motivation is important for every coach-facilitator. It is the key to engaging people in the work of sustainable change that is for the better (change for good). Every time you, as a coach or facilitator, enter into a relationship with a client, you start by clarifying what the client wants: their strategic intent. This is often informed by existing documents like value statements or strategic objectives. Once your mandate is clear, and you begin to work with the designated group or individual, you once again have to create a picture of the intent with the people in the room – including you as enabler of that intent. It sets the context for the work. Of paramount importance here is that this intent must be owned and influenced, or made sense of, by all stakeholders not only by the paying client. Everyone needs to be invested in the process. From this point on, you embark on a journey together, led by the narrative design. You are attempting to get what you want together. You are living through a story, artfully shaped, but not controlled by you, the coach-facilitator. Along the way you and the delegates are going to encounter obstacles. However, because you are using embodied participation as your mode of enquiry, you are allowing an interaction between the narrative design and the embodied participation that mirrors reality. As delegates overcome the obstacles, they are practising for the times they will overcome them when they are back in the real world after the process is over. Because you are working with a narrative design through embodied participation, you are also inviting into the space the stories about all the other times delegates have tried and failed to get what they want. In this way they are able to identify and reflect upon dominant and habitual narratives that may no longer be useful or practical. These are things that people believe or do in relation to the strategic intent that are not producing desired results but that they continue doing out of habit or conviction. The process is non-threatening and playful and allows delegates to experiment with alternative possibilities and solutions. The diagram above shows the relationship between the narrative design of the workshop (represented by the horizontal process line) and a participant’s interaction with it through embodiment techniques (the vertical process line). The entire dynamic is contained by the original strategic intent of the workshop (the circle in the diagram). The centrifugal arrows indicate the new possibilities that are released when the unofficial, dominant or habitual narratives are fractured by the interaction between narrative design and embodied participation. The dotted and curved arrow indicates an emergent new narrative that arises as the more effective one in closing the gap between what delegates want (strategic intent) and what they have (embodied reality). Usually when people hear we use drama or theatre processes in organisations, they immediately assume we do industrial theatre. We emphatically do not. Industrial theatre is like presentation skills, voice training and storytelling skills. All of them help people improve top-down communication from management to teams. SNE is designed to have multilevel, multi-stakeholder conversations in complex systems where leaders feel the need to hear from and listen to team members, where teams need to work together across functions and need to break down silos, and where collaboration, innovation and new direction is sought. SNE is good for strategic planning, relationship selling, customer service, vision and values alignment and leadership development. It is great for organisation development and innovation, team development and facilitator training, but only in forward-thinking organisations where employee engagement, collaboration and a flattening of hierarchy are important themes. 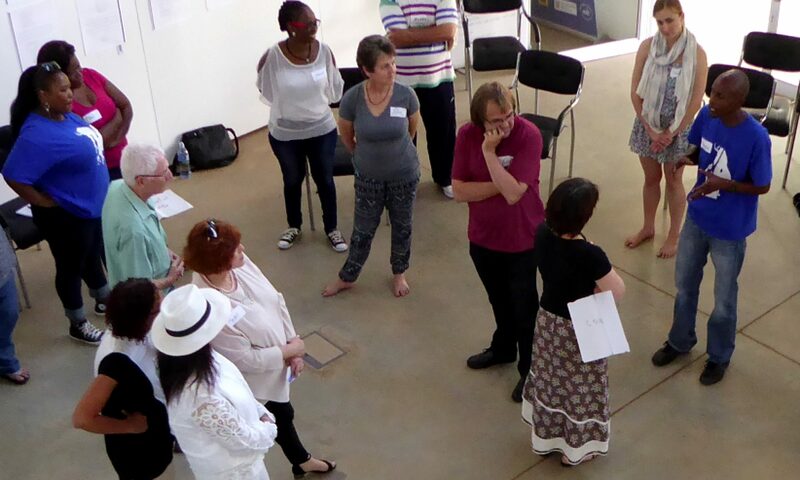 SNE addresses systemic problems and works on the level of relationships. It can address embodied reality, behaviour and action and move beyond words, ideas and dreams. SNE is designed to close the gap between what we want and what we have, what we say and what we do. Next PostNext Exercise: walking with enlarged body parts.